When I started running, I pulled on an old pair of joggers and a baggy t-shirt then picked up my fairly well-worn Reeboks and set off for the first session of the Couch To 5K group. Because I was wearing "my own clothes" I didn't look or feel the part. Also, when I first started looking for fitness clothes, it was a bit of a minefield - I wasn't sure what was best to buy. However, once I'd bought a proper pair of running shoes and specific garb that I would only use for running I felt much more invested in the whole activity. Over the past few months I have bought a few more items of running clothes but I've ensured that they fit me properly and are comfy. 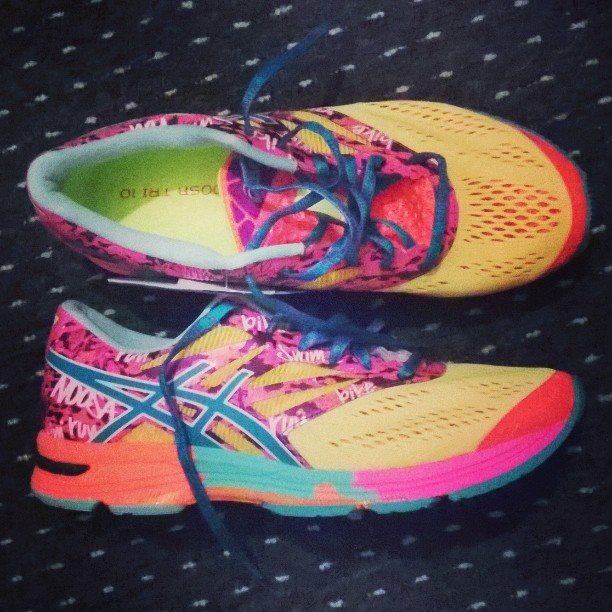 I've also bought a new pair of running shoes recently which are slightly lighter and more fitted around my feet. As for the rest of it... have a look at my video where I show you what I actually wear. None of it was expensive (everything, apart from my trainers, is from Sports Direct and Primark) but it feels GOOD to pull on that 'uniform' and get in a proper mind-set to do something that is normally so alien to me. P.S. Have you listened to any of the Fitbitches podcasts yet? You can subscribe using your own podcast capture app or find each episode on iTunes, Mixcloud or YouTube.